Here is a list of all the postings MattyB has made in our forums. Click on a thread name to jump to the thread. The Germans hold a speed event for such planes every year, and 500 kmh is not unusual. They are even approaching 300 kmh for an under 250 gm class of model. Have a look at some of the planes and equipment on this website. Technically impressive, but the aesthetics of some of those models... As my Gran used to say, "That's a face only a mother could love"!!! ...and the winner of the "My eyes are bleeding" cup...! Sadly we are "not out of the woods" yet. Despite the latest amended CAA Exemption allowing normal height limits (none for < 7kg, 400 ft >7kg) for Old Warden Model Aircraft Club, the club committee have decided to retain the 400 ft height limit that was introduced with CAP 1763 on 13 March 19. The committee have refused to provide any justification for their decision and before you ask it isn't the Shuttleworth Trust who are insisting on a height limit. The only upside is that if anyone were to fly higher than 400 ft for < 7kg (inadvertently) they are no longer in breach of the CAP 1763, but only of the club rule. In addition, model flying events are now free to have no height limit. Would love to say I'm surprised, but based on my single year in the Old Warden Club that's exactly the kind of thing I'd expect. Whislt I was there the committee flatly refused to countenance the idea of a website ("banned by the Shuttleworth Trust " ) or even a members only email board/forum for allowing people to communicate. This was particularly important for me as I am a w/e flyer and needed to know there would be sonmeone there to spot for me whilst I was flying. At the AGM they also annnounced changes to the constitution that had not been communicated in advance; they didn't even have enough copies of the document to be handed round so it was voted on before most people had read the proposed changes! Would it be possible to cut the throttle by flicking a switch 3 times making it go through zero 3 times within, say, 1 second, or so - similar to the way in which the self-test is initiated with the S6R and S8R? This would not be too onerous when cutting the throttle on purpose but would be unlikely to happen accidentally whilst flying or any other time. I take the point about accidentally knocking the switch whilst flying. I am using switch SF as the sticky throttle cut switch but have reversed it so that when towards me the throttle is off and when away from me it is on. This maintains a larger gap between it and the adjacent SE switch so that my fat fingers are less likely to inadvertently cut the throttle. Also, when putting the TX down on its back, the switch is already in the "towards me" position and the throttle is off. If it was the other way round, then putting the TX down on its back might inadvertently flick the switch and enable the throttle. However, I still think the 3-way flick would be the ultimate safe way of not accidentally cutting the throttle. ...PS - I actually designed an “unknockable” safety switch for my Dad’s IC models that addresses your concerns with the sticky throttle cut. 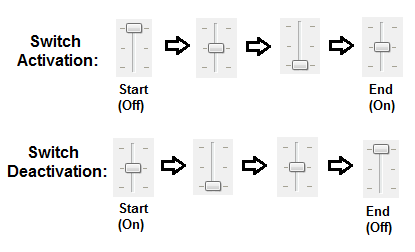 It uses a three position switch and requires a sequence of movements that include a change of direction within a given timeframe in order to activate and deactivate between two states (for instance ignition off and ignition on). It’s more complex to setup but works very nicely - downloadable example and documentation here. One other alternative - you could effectively add in a "dual" throttle cut functionality by linking the switch to certain flight modes. For instance throttle activation/dactivation could be enabled in Takeoff flight mode, but not in Acro or Cruise so if you knocked the switch whilst flying then it wouldn't do anything. The only disadvantage is that if you swtiched to that flight mode without noticing you'd knocked the switch you might end up plummeting quickly(! ), but that should be easily remedied by an audio callout on the switch in question. Mike: Yes, that's what I suspected. Sorry if I didn't explain clearly enough initially. I'm sure there are more applications where this extra functionality could be useful (retracts? ), but the limiting factor might be the displays on the lower spec Txs. MattyB: Yes, I understand that. The problem is that the logic doesn't allow for an alarm in a NOT situation. Mike has got what I'm trying to achieve and has explained it succinctly. Fair enough. I doubt the developers would take that one on though, purely because it is pretty niche - the vast majority of users want this functionality to result in their TX having all the switches in exactly the same positions every time they power on, and the current system does that. The other advantage of having your switches in the identical position every time is it enables you to do a simple visual check of your TX prior to switch on; for instance I always set all mine to be "everything away from me/up" at power up. This gives a small amount of additional safety in my eyes, particularly if you do it consistently across all your model setups. The only other alternative I can think of is swapping that 3 positin switch for a 2, but it may not actually give you what you want at startup as the software will still be looking for a 3 position. Pete I use one of these locking switches for throttle hold on my Jeti coupled with a voice warning. If a similar accessory available for your radio I'd highly recommend it, for belt, braces & a piece of string! The problem with physical mechanisms like this is that if you want to cut the throttle quickly for safety reasons you can’t. On an electric model it’s less of an issue as closing the throttle stick should always stop the prop, but that won’t be the case for an IC engine. Given the huge functionality available in modern radios (particularly the Jeti’s and those which use open source firmware such as OpenTX) that allow software based safeguards to be put in place without that disadvantage I no longer believe physical safeguards on the TX are necessary. YMMV. You need to switch on the preflight checks at startup from the Model Setup menu. Rather than give an audio warning it lists all the switches in their current positions after you switch on, with any that are in a position you haven’t specified clearly highlighted. It won’t transmit until you either set all the switches into the right state or manually accept the current state via the Enter button. In the end I've decided to go for the double hold solution rather than the sticky throttle. This is simply to ensure that should a switch get knocked in flight, the motor will restart instantly when the switch is put back, and not wait for the throttle to be shut when my brain is in panic mode! I have, however, set up logical switches to play audio warnings when the motor is armed (SF AND SA away from me) or disabled (SF toward me OR SA NOT away from me). Now all I need to do is figure out how to enable a switch warning at turn-on when SA is NOT away from me....! That’s an easy one - just set your audio to be triggered by a logical switch with !SA↑ (Plus any additional conditions you want using AND function). PS - I actually designed an “unknockable” safety switch for my Dad’s IC models that addresses your concerns with the sticky throttle cut. It requires a sequence of movements on a three position switch to activate and deactivate across to states (for instance ignition ioff and ignition on). Peter, if you want a copy of the eepe or otx file drop me a PM with our email addy. No need PatMc; when I made those posts I also posted up an eepe on the RCSettings site and linked it from the thread. Short summary... almost all pack C-ratings are made up by manufacturers to sell their packs. If you have a decent charger that can measure the internal resistance (IR) of your packs you can estimate the max C rating of your packs using this tool; in my experience it tends to vary anywhere between 30-70% of the rating on the wrapper depending on brand, age and number of cycles. As has been posted several times it is clear the pilot takes responsibility to ensure the flight can be made safely, not the committee. If an incident came to a court they would look to see what precautions the pilot had taken to ensure that was the case - i.e range and control checks done beforehand, no witnesses stating they were flying in an obviously dangerous way (such as repeated low passes over the pits) etc. The only time equipment could come into play would be if it was not certified for use in the UK for model aircraft (i.e. no CE mark and accompanying certificate of conformity), but the onus would still be on the prosecution to prove it were a contributing factor. Even if they did I fail to see how the committee could be held liable. That, and as Bart told us at the presentation, you can slide in head first and inspect the rudder control mechanism without the need for an external inspection opening. 350kw charging? Everything I have read about charging, irrespective of the battery technology involved, links fast charging to reduced battery life. Used on a daily basis many electric car's battery performance reduces considerably after four years, resulting in not only a reduction in range but also performance. Battery replacement is a significant part of the cost of the car. Roll on Lithium/Air and Aluminium/Air batteries, which if they could 'only' sort out the technology all our electric car dreams would come true! Completely agree - without some kind of leap forward in battery tech these much trumpeted fast charging capabilities are going to reduce cycle life dramatically. Then there are the safety implications of charging at such high currents in highly populated areas. Would you fancy sitting in one of these vehicles whilst charging or even walking past it at the motorway services whilst 1400A are going in? No thanks...! You can learn more about the situation here and here. I note that MacGregor Industries, while advertising the XG11 Tx and other JR products do not seem to allow you to buy them at the moment. I do hope that the new outfit RC Depot and their new arm, Dee Force Aviation (DFA) get the brand going again. The T44 seems to be the renamed XG11 - a great Tx but one which needs it's firmware update service back up and running. Based on that and other sources I have read online I don't think we can really call this a resurrection. Yes the brands and IP have been picked up, but there is really nothing of the original JR company or it's reputation of engineering excellence left. This is effectively a new startup, and I struggle to see how they will gain investment for new products or expand their reach beyond supporting the remaining handful of legacy users of the "old" JR - most people who want a premium 2.4GHz solution have alreadymoved on elsewhere, and the competition at the lower price points is probably even fiercer. EDIT - Apparently when these land they will be £800... I'm afraid at that price stillbirth is almost guaranteed; they are really only an option for die hards who don't want to give up their DMSS RXs. With no guarantee of the QC levels being the same as the old JRs it may even be a difficult sell to users of legacy JR kit. Seems to fly very well - great work Max. Quite a bit faster than I thought it would be, but clearly an excellent flier. I've done the weighing and power checks now. The latter proved a bit of a puzzle as I'm only pulling 210W on 7x6" props from both motors from 2x2200 3S lipos in parallel; my standard for larger models. The Hobbyking spec for the Turnigy 2863/8 1100Kv motors says they pull 336W each at 18A and 15v, which I should have spotted is rubbish, as others have recorded on forums various. The model weighs 4lb 12oz ready to fly which around 40W/lb, rather less than some of the tables suggest for good performance. However, as fellow clubmates and I have found, brushless motor watts go further than old brushed motors watts, on which the tables are based. The static thrust is 2lb 2oz which ought to be enough. It's a vintage biplane not a pattern ship! 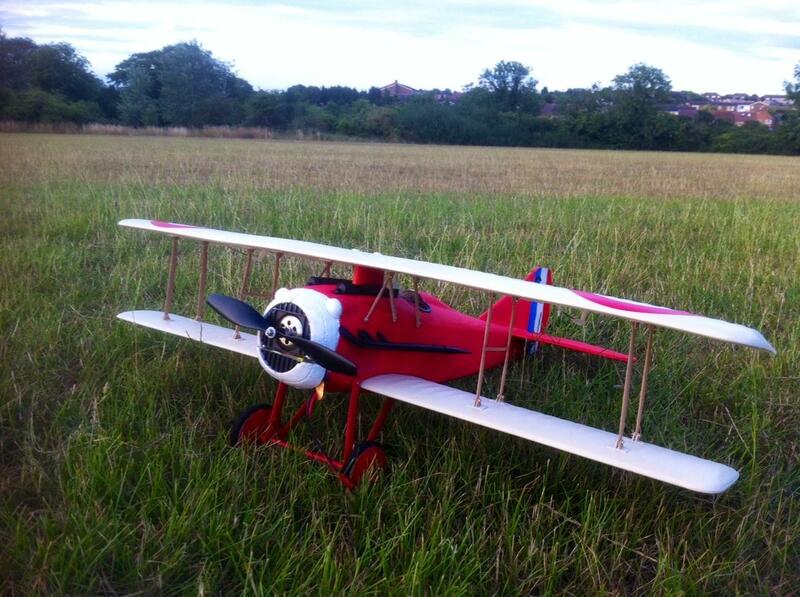 I've done the CG calculations which are not wholly straigtforward for a swept winged biplane. I hope I've got it right. I just need a fine day and a friendly test pilot now. I'm a safe flyer but I'm not up to first flight out of trim surprises. I have a lightweight foamie parkflyer Spad from HK that was originally designed for 2S, but because of their strange design decisions ended up on 3S. I put it on an diet to be able to fly it on 2S in small spaces, and it has ~45W/lb. It is perfectly flyable (from a hand launch, ROG is impossible due to it's small size), but was very hairy on the first flight. Given how much time and effort you have put into building this beauty I would encourage you to think of a way to get at least 60W/lb for your first flights, whether that is by going up to 4S or fitting new motors. The additional cost will be forgotton when you see it soaring confidently overhead, but it would be horrible to lose it because of a powertrain miscalculation.